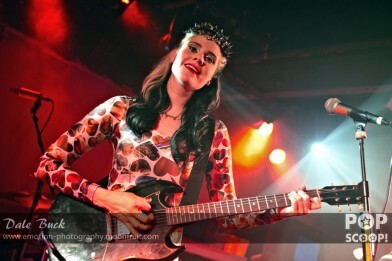 Since she memorably burst into the UK charts back in 2007, Kate Nash has developed and deepened her musical style, successfully expanded her repertoire of creative outlets, and matured into the type of pop/rock star who will surely be entertaining and surprising us for decades to come. Having initially uploaded her music to MySpace, Kate quickly shot to fame with her single ‘Foundations’ (UK #2) and debut album ‘Made of Bricks’ (UK #1) produced by Paul Epworth, and a 2008 BRIT Award for Best Female Artist. In the wake of Lily Allen, her cheeky, confessional lyrics, Cockney accent, and sunny indie-pop tunes were right on the Zeitgeist pulse. With subsequent albums ‘My Best Friend Is You’ (2010) and crowd-funded, independently released ‘Girl Talk’ (2013), Kate has diversified her sound to include elements from soul and Motown to Riot Grrrl and garage punk. Alongside launching her own music label Have 10p Records, she has also acted in three feature films (including this year’s ‘Syrup’ and ‘Powder Room’) and worked tirelessly lobbying and campaigning for female empowerment and emancipation projects such as the Kate Nash Rock ‘N Roll for Girls After School Music Club. Kate Nash delivered the first gig of her autumn UK headline tour, on 10th October 2013 at Norwich Waterfront, with the total commitment and energy of a woman newly reborn. Dressed in a psychedelic, heart-covered catsuit/skirt/cape ensemble + spiky hairpiece and accompanied by her solid anti-Robert Palmer all-girl 3-piece backing band, Kate gave the crowd a comprehensive 14-song career-spanning set. But if anyone only familiar with her early work was expecting a laid-back yet sparkly evening of playful indie-pop, they were in for a real shocker! The overall sound and vibe were pure indie-rock/no wave/garage punk in keeping with her recent album ‘Girl Talk’. Alongside hard and heavy renditions of newer tracks ‘Death Proof’, ‘OMYGOD!’, ‘3AM’ and ‘Fri-End?’, old favourites such as ‘Foundations’, ‘Mouthwash’, and ‘Do-Wah-Doo’ were also given a run through the musical wood chipper, emerging fresh and raw once again. To top it off, Kate appeared to be having the time of her life and fully ticked all the crowd-engagement boxes: abruptly stopping mid-song out of concern for a possibly fainted audience member, only for her to discover the person had simply been sick due to alcohol and then laugh it off by throwing towels over the affected area; stage dive and crowd surf; and bring fans onstage to dance and sing with her during final song ‘Under-Estimate the Girl’. Her old keyboard even got a look-in for intimate encore ‘Merry Happy’. All hail Kate Nash 2.0! Pop Scoop! was lucky to sit down and have an in-depth conversation with Kate right before her Norwich Waterfront gig. She spoke about her changing musical style, the dynamic between her lyrics and her music videos, the ways in which she writes songs, how she first got into music as a child, the story of what ultimately pushed her towards a solo career, and looking back what she now feels about her meteoric rise to fame. She also gave us an insight into her important and timely thoughts on the inherent dangers of social media, celebrity worship and the ever-increasing sexualisation of today’s mainstream pop culture.